Delicious black teas are loved in the West. Full-bodied and strong, they taste great alone or with milk and sugar. And they make great iced tea. The caffeine makes them a good morning tea. 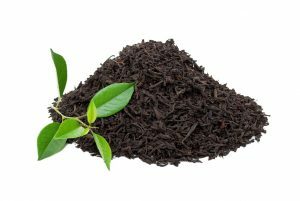 No one is certain exactly when and where black tea was invented, but there are two stories that may explain the first discovery of black tea. The “Wuyi” theory, thought to be one theory about the creation of oolong tea, is also significant in Chinese black tea history. Compressed tea cakes had been made in the Wuyi Mountains since the Song Dynasty. When the emperor of the Ming Dynasty demanded a shift to loose leaf tea production, the tea producers made several attempts at making premium loose leaf teas. During this new process, tea leaves would turn red as a sign of fermentation. Because of the red color of the tea leaves, black tea was readily known as red tea in China (not to be confused with Rooibos red tea). Another story of black tea’s invention takes place in the Chinese village of Tong Mu. Sometime during the 16th century, army soldiers passing through Tong Mu village temporarily stopped production of green tea. The soldiers made beds out of piles of tea leaves and when they finally left the village, the tea leaves had turned black. Tea processing was resumed with these black tea leaves and a new kind of loose tea was born. 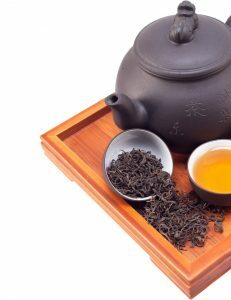 Health benefits of black tea: Medical research suggests that black teas assist in lowering cholesterol, preventing the absorption of cholesterol into the blood, gently stimulating the heart and circulatory system, keeping blood vessels soft, regulating blood sugar, and lowering blood pressure. It can help prevent heart disease and strokes. Contains 20% of the caffeine in coffee. Delicious black teas are loved in the West. Full-bodied and strong, they taste great alone or with milk and sugar. And they make great iced tea. The caffeine makes them a good morning tea. Medical research suggests that black teas assist in lowering cholesterol, preventing the absorption of cholesterol into the blood, gently stimulating the heart and circulatory system, keeping blood vessels soft, regulating blood sugar, and lowering blood pressure. It can help prevent heart disease and strokes. Making loose leaf black teas tea usually requires hot water at 195º, 1.5 tsp of loose tea per 8 oz of water and steep time of 3-4 minutes. Each of Harvest Cafe’s loose leaf black teas will come with specific preparation instructions, including the amount of tea to use per 8 oz. of water, at what temperature the water should be, and how long the tea must steep before it is ready. Please refer to the individual tea package for the exact instructions on how to make the best cup of premium black tea. Green tea has been consumed in Asia for centuries. When green tea was first discovered in China, only the wealthy and elite drank the expensive beverage. By the 1400s, green tea was the drink of choice for Chinese commoners as well. It was essential for seafarers since green tea consumption prevented scurvy. There are several regions in China that produce some of the finest premium green teas. Green tea was brought from China to Japan in A.D. 803-805. A Japanese monk who had been studying in China planted seeds of the Chinese tea plant at his monastery. After serving the tea to the Japanese emperor the emperor ordered for the creation of more tea cultivations sites and eventually different varieties of the green tea were born. Such varieties include Gyokuro Green Tea and Sencha Green Tea. Green tea is often referred to as the unfermented tea because after harvesting the leaves are dried and then heated to stop fermentation. Health benefits of green tea: Green tea is very high in antioxidants that boost the immune system and may help to reduce the risk of cancer (polyphenols), particularly lung, colon, and skin cancers.Green tea also contains EGCG complex, which is very good for metabolism. In addition, green tea helps to regulate your blood sugar, resist cavities and gingivitis, and it is good for your skin. In general, when making green tea, hot water should be at 175º (adding two ice cubes for every 8oz of boiling water achieves approximately this temperature). Use 1 tsp per 8 oz of water and steep for one minute; hand-rolled teas like jasmine pearl tea will take about a minute longer (to allow the pearl to unfurl first) and shade grown tender tea bud teas like Gyuokuro need only 30-45 seconds to steep. Each of Harvest Cafe’s loose leaf green teas will come with specific preparation instructions, including the amount of tea to use per 8 oz. of water, at what temperature the water should be, and how long the tea must steep before it is ready. Please refer to the individual tea package for the exact instructions on how to make the perfect cup of premium green tea. The Chinese were known to have discovered tea thousands of years ago. Likewise, the Chinese were using herbs for their medicinal properties for centuries and they were the first to introduce herbs into tea drinking. Fruits, vegetable, herbs and flowers were often added for medicinal reasons as well as to improve the taste of teas. Eventually a version of tea called a tisane was created that didn’t actually include any tea. 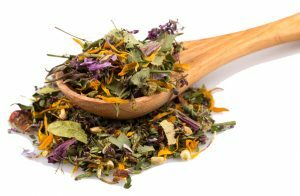 An herbal tea or tisane is an infusion made using fresh or dried flowers, leaves, seeds or roots. Many herbals have health properties and most are naturally caffeine free. With the exception of Yerba Mate, all Harvest Café herbals are caffeine free. Health Benefits of Herbal Tea: Herbal teas are rich in antioxidants and vitamins, particularly Vitamin C. Typically herbal teas are also caffeine-free, so they can be enjoyed anytime during the day. Depending on the fruits, vegetable and other ingredients, they may have additional health benefits. See each tea for details. Making loose herbal tea usually requires hot water at 208º, 1.5 tsp of loose tea per 8 oz of water and steep time of 4-5 minutes. Many herbal teas taste great when iced. To make herbal iced teas, simply double the amount of tea used. Steep with the same hot water temperature and steep time as if making hot tea, then pour the brewed tea into a cup nearly full of ice. In 1772, Swedish botanist Carl Thunberg found the people of the Cape of South Africa were making tea from local plants, specifically, the Rooibos plant. By the 1900s, settlers of the Cape refined the curing process to make African red tea, employing similar methodologies of green tea processing. Soon after cultivation of Rooibos red bush tea spread throughout South America and more recently, has broken into the American tea market for its unique taste and health benefits. Rooibos teas are herbal infusions. There are also green Rooibos teas that are just as delicious as the popular red teas. Rooibos teas are delicious iced or hot and come in a wide variety of flavors. 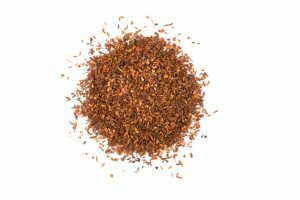 Health Benefits of Rooibos Tea: These naturally caffeine-free teas are extremely high in antioxidants and typically Vitamin C as well (they often contain fruit pieces). Rooibos teas may also help to relieve allergies, increase iron absorption, and aid indigenstion. They also promote healthy skin, teeth, and bones and are suitable for those with a sensitive central nervous system. Making Roobios tea is very similar to preparing any other herbal tea. 1.5 tsp of Rooibos tea should be added for every 8 oz cup of boiling water. The Rooibos tea should steep for 5-6 minutes. If left to brew longer, the Rooibos tea should not become very bitter, as this type of tea has steeped for days in some South African households. Many Rooibos teas also taste great as an iced tea. To make Rooibos iced tea, just double the amount of tea used, steep at the same temperature and for the same length of time, then pour the tea directly into a glass full of ice. 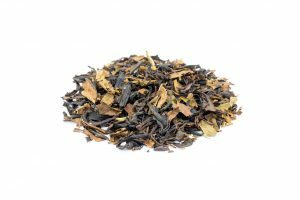 African “red bush” tea, originally harvested by the indigenous people of South Africa’s Western Cape, is a delicious caffeine-free alternative to black tea with significant health benefits. Naturally sweet, soothing and healthy, Rooibos is both delicious and versatile. White tea was the preferred drink of royalty as far back as the Tang Dynasty in China (618-907 A.D.). Prized for its mild and delicate taste, white tea was known as the Emperor’s Drink and general population could not partake. Around the nineteenth century, there became more variety in white teas from tea bushes that were cultivated to make the well-known Silver Needle tea and other types of white teas. White tea is the least processed of all teas and many tea experts consider it to be one of the finest teas in the world. The Chinese consider white teas to be detoxifying and refreshing. To create scented teas, fresh flowers or fragrant herbs are added to the tea during the drying process which then impart a flavor to the tea when infused. Health Benefits of White Tea: White tea is the least processed tea, so it is very high in antioxidants and very low in caffeine. Studies show that antioxidants in white teas help to reduce the risk of cancer, particularly lung, colon, and skin cancer; antioxidants also strengthen your immune system and help with metabolism. White tea is also excellent for hydration of the body and the skin, which acts naturally to reduce the signs of aging (fine lines and wrinkles). White tea also aids in detoxifying your body. A cup of white tea only has about 1% of the caffeine in a cup of coffee. All tea includes fluoride, which strengthens tooth enamel and reduces the formation of plaque. Some white teas may have additional health benefits. Generally, brewing white tea requires hot water at 175º (simply add two ice cubes for every 8 oz of boiling water to achieve this temperature). Use 1.5 tsp of loose tea per 8 oz of water and steep for 4-5 minutes if using unflavored white tea and 1 minute for flavored white teas. Each of Harvest Cafe’s loose white teas will come with specific preparations instructions, including the amount of tea to use per 8 oz. of water, at what temperature the water should be, and how long the tea must steep before it is ready. Please refer to the individual tea package for the exact instructions on how to make the perfect cup of white tea. There are three theories of how oolong tea came to be. First, in the “tribute tea” theory, oolong was thought to have been derived from the Dragon-Phoenix tea cake when the emperors began favoring loose teas during the Ming dynasty the 16th century. Then, the long black loose tea was called Wu (meaning black) Long (meaning dragon) tea; hence, wulong tea was also known and Black Dragon tea. In the “Wuyi” theory, oolong tea was first made in the Wuyi Mountain of the Gujian province. Poems like the Wuyi Tea Song and Tea Tale tell of oolong tea being processed in the Wuyi Mountain. Last, the “Anxi” theory claims oolong tea came from the Wulong plant, named after its discoverer, Sulong which was misinterpreted as Wulong. Oolong teas are full-bodied with a fragrant and fruity aroma. They are semi-fermented teas, so they have some of the same qualities as green and black teas. Oolongs have about 15% of the caffeine in a cup of coffee. Often called weight loss teas because they help burn fat built up in the body. They are often served in Chinese restaurants. Health Benefits of Oolong Tea: Excellent with meals, Oolong teas help to lower the intake of fat content from high-cholesterol meals and increase metabolism (this is why it is known as “diet tea”). The tannic acid in Oolong teas also helps to lower cholesterol levels. Good for the skin as well. Typically a very relaxing drink, although it does have a slight amount of caffeine. Making loose leaf oolong teas tea usually requires hot water at 195º, 1.5 tsp of loose tea per 8 oz of water and steep time of 3 minutes. Each of Harvest Cafe’s loose oolong teas will come with specific perparation instructions, including the amount of tea to use per 8 oz. of water, at what temperature the water should be, and how long the tea must steep before it is ready. Please refer to the individual tea package for the exact instructions on how to make the best cup of oolong tea.